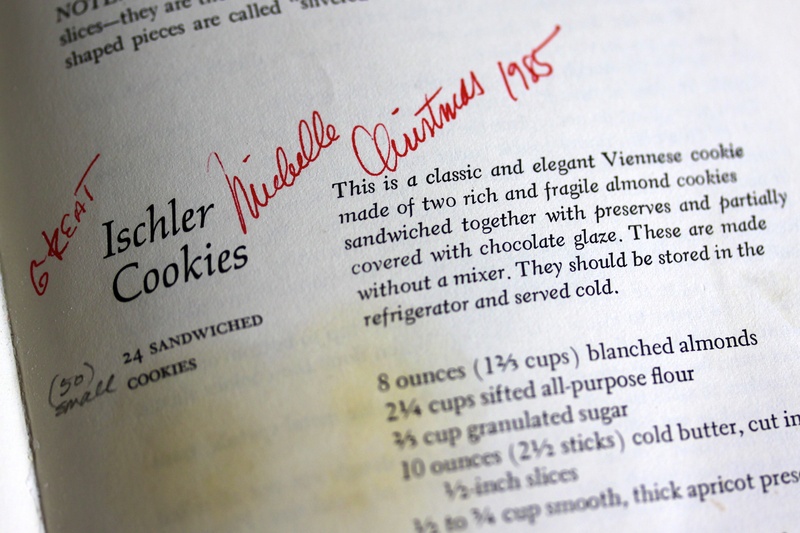 Once upon a time, when much younger and much more energetic, Michelle made cookies to share with friends and family for the holidays. Of course, Michelle being who she is, these cookies were very, very good—but also took up very, very much of her time. Within a few years she was spending virtually the entire month between Thanksgiving and Christmas obsessively thinking about cookies, making cookies, packaging cookies and distributing cookies to a growing number of people, constantly trying to outdo the last season’s gifts. (Alas, in those days, it never occurred to anyone to waste film on a photo of a cookie assortment so we have no visual record of it.) Of course, simple human frailty, work demands and a finite amount of freezer space made this trajectory as unsustainable as the housing bubble, and the cookie-making crash saw the holiday cookie boxes stay unfilled for many years. This season, however, Michelle has quietly begun a new cycle, tackling as her first return her famed Ischler apricot sandwich cookies made from an old Maida Heatter recipe. 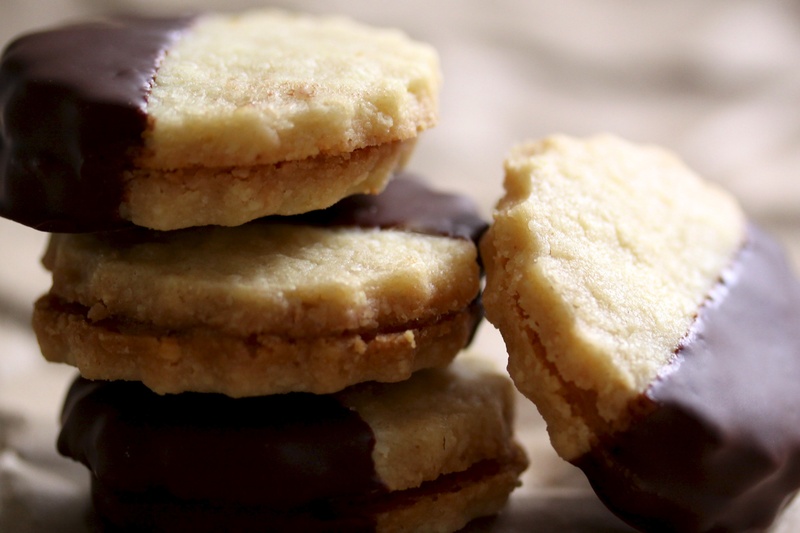 It takes an astonishing amount of effort to produce even a few of these buttery-short almond delights, sweet with apricot jam filling and dipped in silky bittersweet chocolate. In the old days, most were reserved for Michelle’s mother (and Steve, who is not, we are sad to say, above stealing). Michelle plans again to give most of the Ischlers to her mother, but has been reviving the Christmas cookie tradition with a few more varieties, some old and some new. The sweet cookie stocks found before the turn of the century may never return to their dizzying heights, but the denizens of Gourmandistan (OK, mostly Steve, who cooks no cookies) see even this modest recovery as a very positive holiday development. Put almonds in food processor and grind to a fine powder, just short of turning into a butter. Place ground almonds in a large mixing bowl. Add flour and sugar and stir to mix. Use a pastry blender to cut the butter into the dry ingredients until the mixture resembles a coarse meal. Turn the dough out onto a smooth work surface. Squeeze dough between your hands until it holds together. Form into a ball, flatten it a bit and then break it—that is, use the heel of your hand to push off small pieces, smearing against the work surface until the butter is fully incorporated into the dry ingredients. Form the dough into a ball again. Divide the dough in half. Form each half into a flat round disk on a piece of wax paper. Place another sheet of wax paper over. Use a rolling pin over the top paper to roll the dough 1/4″ thick. Slide cookie sheets under the wax paper-enclosed flattened dough. Transfer to the freezer (or place outside on a cold day). Preheat oven to 350° F.
When dough is firm, pull off wax paper. Cut out using a 2″ to 2-1/2″ round cookie cutter. Place cookies 1″ apart on ungreased cookie sheets, using a metal spatula if necessary. If dough has warmed up, put back in the freezer for a bit to firm so cookies will hold their shape. Reserve scraps and repeat process of rolling, cooling and cutting. Bake cookies for 12-15 minutes, reversing the sheets front to back and top to bottom midway through. The cookies, when done, will be lightly golden (not brown). Remove with a spatula and cool on a wire rack. Match up cooled cookies into pairs of equal sizes. Strain preserves through a sieve or (lazier way) process in food processor. Hold a cookie in one hand and spread the under side with a thin layer of preserves, keeping a bit away from the edge. Cover with another cookie (under side to preserves) and press together gently. Repeat until all cookies are made into sandwiches. Melt chocolate and shortening over very low heat in a small pan. Transfer to a small bowl. Line a couple of cookie sheets with wax paper. Dip cookie sandwiches into chocolate glaze until sides are about half covered. Wipe edge of each sandwich against top of bowl to remove excess glaze. Place on wax paper. When all cookies are glazed, place cookie sheets in freezer or refrigerator to allow chocolate to set. When glaze is set, cookies can be removed and stored in a container, in layers separated by wax paper, in the freezer. These cookies are best when served chilled or frozen. What a clever post! Love the recipe too and the photos. Thanks much! These are really great, possibly the best cookies ever I have to say (except perhaps the ones I baked today…). Such beautiful photos..and I wish I was your mother! Well, there is FedEx. Thanks much! Yum, all those different flavors must taste amazing together. Cant wait to make it! They really are worth hoarding. Or, sharing with a very few! 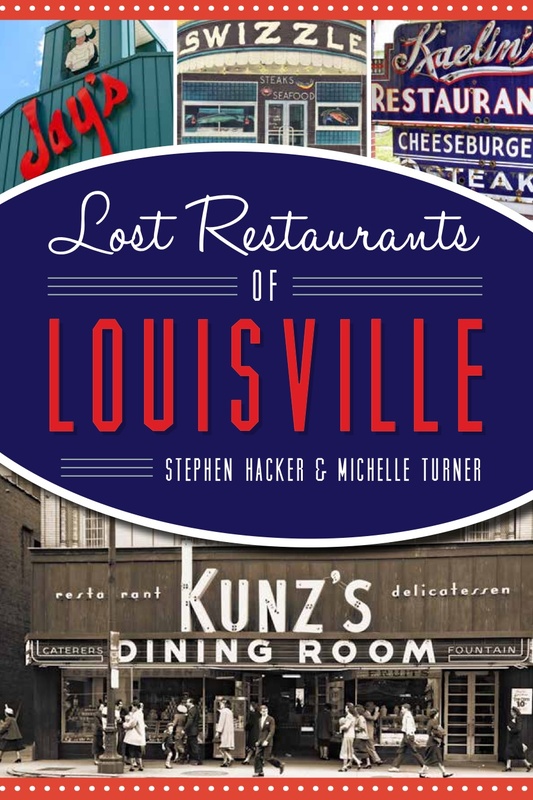 Hello fellow Kentucky foodies! I love apricot and generally make apricot thumbprint cookies just for me to enjoy at Christmas, but never thought about combining them with chocolate. These look divine! Gorgeous cookies, wonderful post, delicious as a vicarious treat for this involuntarily gluten-free person. Oh, I forgot about that. I guess we’ll have to be the ones to test those gorgeous looking biscuits in your Sweet, Sweet Sorghum cookbook! Yum! I can smell those beautiful cookies from here. Shall I come over and help you eat them? Thanks for sharing the recipe :). Oh, joy joy! Steve, I’m counting…. Don’t worry. They’re pretty well hidden! I feel like I can taste these through your beautiful photos. I am assigned this week to take the lead in preparing for our holiday cookie/dessert party. Dare I try this? Dare I not? They’re not terribly difficult, but they are fiddly! And her I am in 2018, delighted to report that this is really the only useful thing I do at Christmas, but She Keeps Me Around just for this, apparently. Great post! My Hungarian MIL taught me to make these when I first married and they have become my absolute favorite cookie! I’ve never tried apricot preserves, but that sounds great! I usually use red currant jelly. I like them best the day after made, when the jelly has a chance to soak into the cookie a bit. And yes, they are definitely worth hoarding/and or fighting over! They disappear very quickly! When I was growing up in nyc, there was hungarian bakery called Lichtman’s that made these cookies. hit and don’t last long. What a nice memory. Thanks for sharing. And, more chocolate is seldom a bad idea!